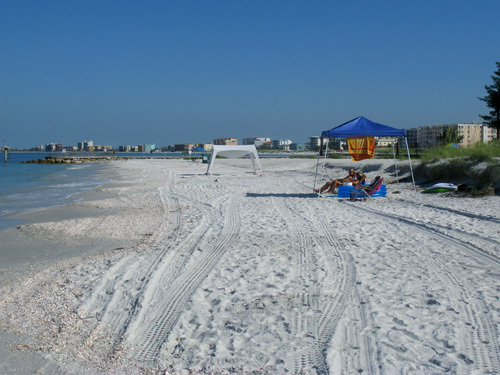 Sunshine Beach is a on the northern most end of Treasure Island, FL. 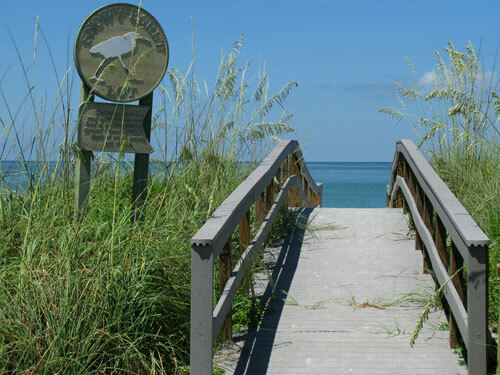 Starting just south of John's Pass, this laid back beach parallels Sunshine Blvd for about seven blocks between 126th Ave and 120th Ave. This small beach is very quiet and unassuming. Laid back is an understatement. 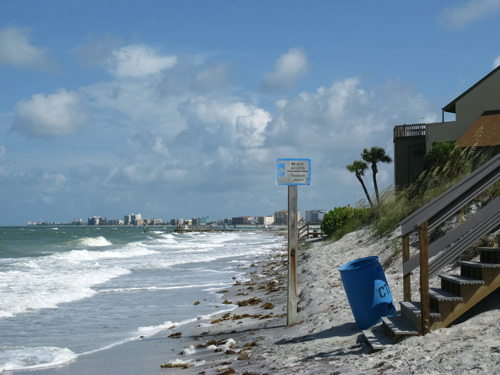 Believe it or not, it is actually listed on the National Oceanic and Atmospheric Administration charts for the Pinellas County Gulf Beaches west of St Petersburg FL. You rarely see young families with children on this beach. There are NO frisbees flying around, NO loud young people with coolers of beer. Most of the people who go here are older. They are residents on this northern end, or retirees traveling and renting out a condo/apartment. 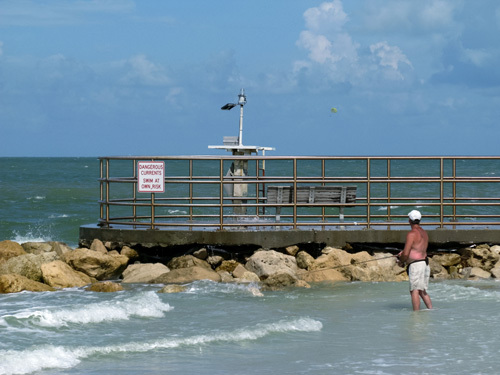 It is a nice place to swim, walk over and watch the boats go in and out of John's Pass, read, and doze off. The most noise you ever hear are seagulls screeching, or the horns announcing the opening of John's Pass Bridge a few hundred yards away. 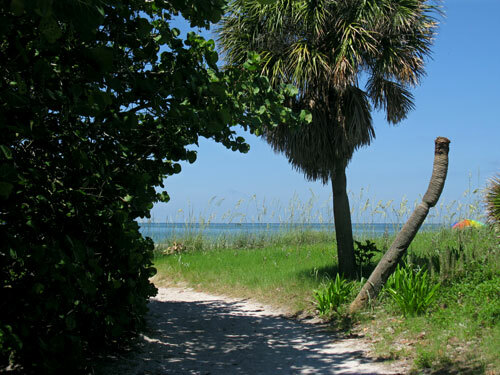 This path leads away from the beach access at the west end of 127th Avenue. Although there are no parking meters here, I still do not know if I'd chance it. I did not see any signs saying NO PARKING, but I could have missed one. 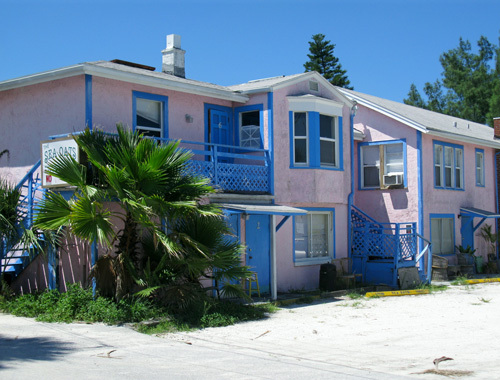 The Sea Oats Apartments are across from this open access road on the south side and have their own yellow parking curbs. 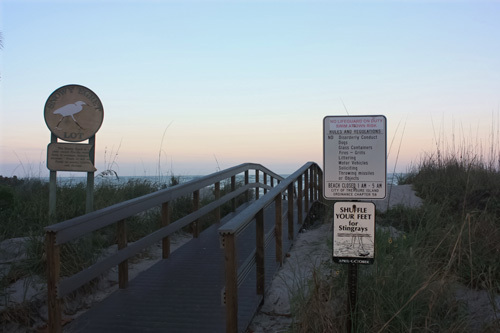 The jetty that borders John's Pass is the first thing you see when you come down the path. My advice is to stay away from it. There are strong currents near it...and probably a million snagged fish hooks. If you go a block south, to 126th Avenue, you'll find Snowy Egret parking lot. It has about 12 spaces. Make sure you bring a handful of Quarters. The walkover leads right down to the Gulf. However, as you can see, high tide on this narrow beach doesn't leave much space for snoozing in the sun. This is why most people set up in the wide area at the far northern end. 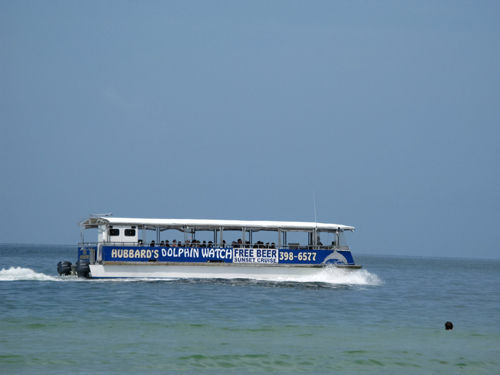 The most exciting thing that happens out here on Sunshine Beach is when the Dolphin Boat comes by. 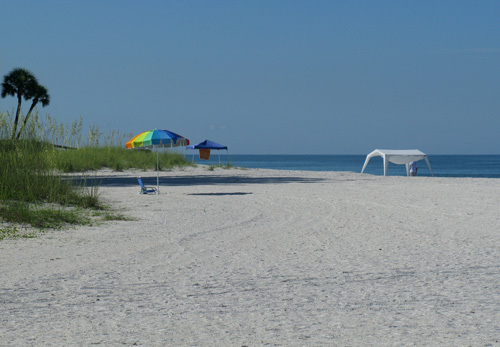 If you are looking for one of the most quiet beach areas on the Florida Gulf Beaches, Sunshine Beach just might fit the bill.